CRM AND CUSTOMER EXPERIENCE: ACCORDING TO GARTNER, THE BEST SOLUTIONS ARE PROVIDED BY ORACLE! The market for CRM (Customer Relationship Management) grew by 21.4% during 2016, and does not seem to stop even in the current year. Lead management applications facilitate marketing and sales operations through a variety of steps thanks to their capability to generate value from the knowledge of end-users regardless of what the company’s specific business is. For companies it is crucial to know their customers very well so that they can satisfy them and increase their loyalty. Company’s goal is the improvement of Customer Experience, namely the way customers perceives their interaction with the company. The strength of lead management applications is to be able to collect as many information as possible from a variety of sources, including: data released by users during their web session, like registration data, or data directly published online on social media. Obviously, if the company collect more information then the possibilities of creating new contacts and identifying new business opportunities will also increase. 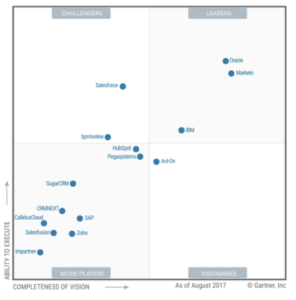 This new super partes research made by Gartner to classify all the vendors of CRM solutions in 4 categories (“leaders”, “challengers”, “visionaries” or “niche players”), crown, once again, Oracle as the best in the market. “Magic Quadrant for CRM Lead Management” research highlights the high quality standards that allowed Oracle to achieve this fantastic result thanks to the excellent integration between the various applications that compose Oracle Marketing Cloud, the solution sold by the company. Another advantage for the Californian company is the dense portfolio of partners and their integration. The ecosystem developed around the product has allowed the introduction of more than 140 solutions in addition to those of the previous year, and this reveals the will to innovate and provide to users up-to-date solutions.